How do app updates work? The changes listed below require a complete resubmission to app stores. 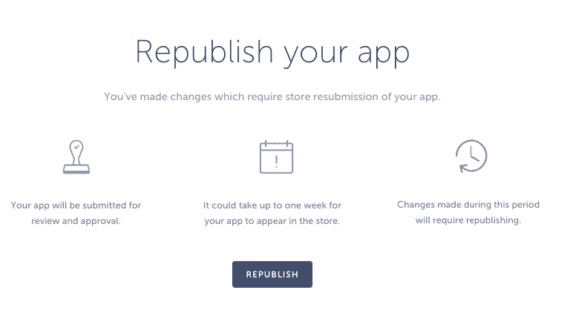 After you click on the Republish button, the builder will automatically send a resubmission email request to our internal review queue from where our publishing team will update your app in the stores with the necessary changes. You will receive an additional notice once the process is completed. Since changing the name and title of the app is locked once you publish, Contact Us to let us know the name and title you wish to use. We will update name/title in the builder and resubmit the app to stores, so that the changes go live. Users will see this as a store-based update, or a new app version. Users who don’t enable automatic app updates must visit the App store on their device, and make the updates manually. These updates don’t require a new app file submission. 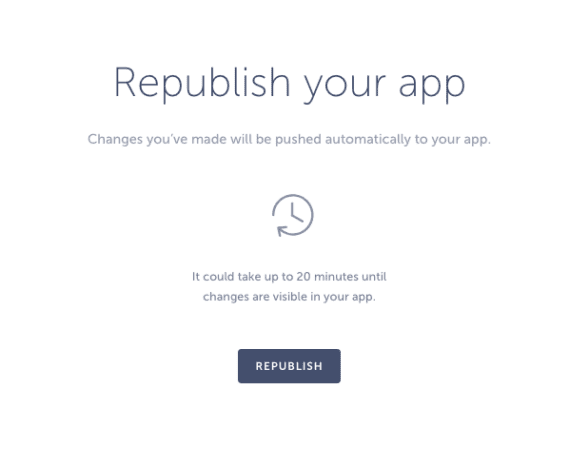 They are visible to users after you click Republish, or, after a manual app restart on the user’s end after 20 minutes. For example, when you add content to existing categories (i.e. categories created before the app was submitted to stores), changes will update automatically. However, if you add new Categories or extra menu icons, you must click the Republish button or your changes will not be visible in your live app. and so on…. to sum up, if the change is NOT on the Binary updates list above, the live app can be updated without needing an app resubmission. Didn't find what you were looking for? No problem! Feel free to write to our support team.